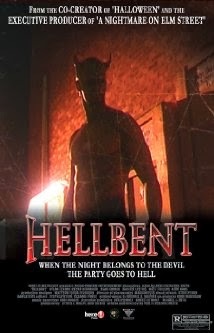 Hellbent is an independent horror movie that I happened to stumble upon on Netflix some years ago. We’re all familiar with the Netflix horror selection:it’s a lot like playing Russian Roulette sometimes. So, after a few poor choices on my part, I chose to revisit Hellbent. Directed by Paul Etheredge, it may be low budget, but it looks good, is well acted and feels exactly like a proper slasher film from the 70′s or 80′s. It’s Halloween night in West Hollywood and four friends are dressed up and ready for a night of fun. Unfortunately for them, there is a devil-horn wearing, scythe wielding serial killer collecting heads on the loose. Eddie, the token sensible character, also happens to work for the police department and has insider knowledge that these killings are taking place. He warns his friends to be cautious, but they just don’t take him seriously. Basically, we have a group of horror stereotypes in the characters (i.e. nerd, jock, slutty guy etc. ), but they’re all likeable and you quickly root for their survival. This being a slasher film, that’s not necessarily going to happen, but they’re fun while they’re around. Let’s be clear:this is a camp-tastic horror film. The killer has no obvious motive and there isn't really any kind of back-story to anything. Much like Michael Myers, this guy is walking around on Halloween night looking for people to kill. A chance interaction with this particular group of friends is what causes the killer to focus on them. The f/x are well done for the budget, the pace moves along nicely and some scenes are truly suspenseful. Hellbent has declared itself the “First Gay Horror Flick” and while it’s a film made by the homosexual community, it’s not specifically for any one group; it’s a slasher film through and through. One of the really refreshing things about Hellbent is that 99% of the characters are gay:not just the killer. This negative stereotype still persists in modern horror and it’s refreshing to see a movie that bucks the trend. There aren't any moral undertones or messages in the movie. It’s just a fun horror movie with characters you can relate to, a creepy killer, some great low budget f/x and a wicked sense of humor. There is a particularly memorable scene involving an eyeball and, like any good slasher movie, the suggestion of a sequel. If you’re looking for a good popcorn type of horror movie, then you need look no further.